According to recent studies by both Consumer Today and Zagat, the number one complaint with diners in restaurants is irksome background noise – often created from a combination of loud talking and music. According to recent studies by both Consumer Today and Zagat, the number one complaint with diners in restaurants is irksome background noise – often created from a combination of loud talking and music. Patrons find having a conversation with others over dinner problematic, and that noisy background din often extends to communication with servers and/or bartenders when it comes time for placing an order or making a request. Quite frankly, studies show, restaurants and bars are simply getting louder. Another issue is age. While the beach resort regions of Delmarva have a strong 55 plus active lifestyle focus, age related studies show that 25% of people over the age of 55 have developed obvious hearing loss – a number which only increases to 50% for those 70 and older. Conversely, younger patrons are more accepting and can tolerate higher decibel levels better than those over the age of 50. While some level of noise is acceptable and even desired by both diners and many dining establishments (no one likes to dine in a mausoleum), a balance between the decibel levels of a vibrant, active restaurant and that of a speeding train in downtown Manhattan (which registers at 84 decibels while normal conversation is from 60 to 65 decibels) seems to be the sweet spot. 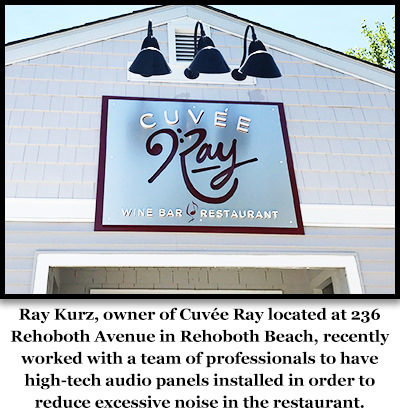 Ray consulted with a team of professionals, including former restaurateur and live music event manager Sydney Arzt, interior design specialist Judith Davidson and even Bob Yesbek – aka The Rehoboth Foodie – who has a professional background in audio production and live music performance. After looking at a variety of options discussed with the team, he decided to install sound absorbing, decorative panels throughout the restaurant in locations selected for maximum effectiveness. “Almost immediately after the installation, you could hear the difference,” said Ray. “Judith did a great job installing the panels with her team and she selected a variety of sizes and designs that worked perfectly with the look and feel of the restaurant that she helped to create. We had them up just in time for the Libby York concert here which was a huge success,” he added. “I’m grateful for the input of everyone involved in the process and I’m glad that patrons of Cuvée Ray can now enjoy their fine dining experience, a fantastic glass of wine and some top-notch music without having to strain to hear each other in conversation. The warm and welcoming atmosphere here has only been improved by the addition of the panels, and while the process was expensive, the benefit of having them far outweighs the cost,” Ray continued. Ray also mentioned that they were happy to have the panels installed before the kick-off of the famous Rehoboth Beach Jazz Festival. Several jazz musicians are slated to perform at Cuvée Ray that weekend and he and his staff are confident that everyone will be able to enjoy all the wonderful aspects of the live entertainment and the dining without the nuisance of additional noise. For more about Cuvée Ray Wine Bar and Restaurant, including a calendar of events, menu, specials and more, visit www.cuveeray.com.